Named One of the Top Five Reads for the Summer by Backpacker magazine, a riveting high-altitude drama for readers of Into Thin Air. 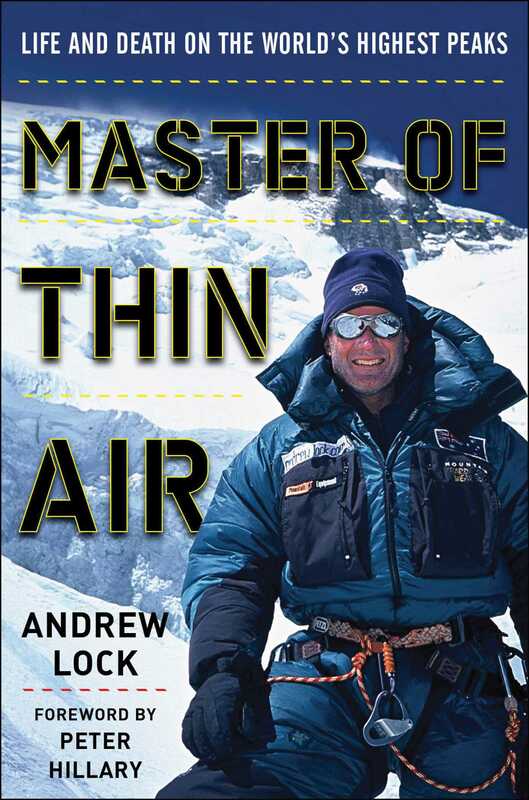 Master of Thin Air opens with a fall down a three-thousand-foot drop that very nearly killed author Andrew Lock. The qualities that saved him then on K2in addition to his mountaineering know-how and sheer good luckdrove his sixteen-year journey to summit all of the world's eight-thousanders, the fourteen peaks that exceed 8,000 meters (26,000-plus feet) and take climbers into the death zone. Incredibly, he accomplished that feat without the aid of bottled oxygen for every mountain but one. By preference, he climbed solo or in small teams, without Sherpas. During twenty-three expeditions, he spent a total of three years clinging to the sides of dangerous mountains. He lost more than twenty climbing friends and, in April 2014, witnessed Everest's deadliest avalanche. His book is a riveting, often thrilling account of what it takes to challenge the Earth's highest peaks and survive. It tells of death-defying ascents and even riskier descents, the gut-dropping consequences of the smallest mistakes or even just bad luck, the camaraderie and human drama of expeditions, the exhilaration of altitude. It is also the inspiring story of what motivates a person to achieve an extraordinary dream, a story of passion, resourcefulness, and hopeeven in the most dire moments. Andrew Lock was the eighteenth person ever to scale all fourteen eight-thousanders, though he comes from the flattest country on earth. Awarded the Order of Australia for Services to Mountaineering, he has guided multiple teams to the summit of Mount Everest and the other highest peaks of the world. A professional keynote and motivational speaker on leadership, motivation, teamwork, goal setting, and risk management. He lives in Campbell, Australia. Visit his site at www.andrew-lock.com.